Fishing Forever, the China-based parent of the Nova Scotia lobster company, is slated to load up a Boeing 747 with the crusty crustaceans on Jan. 7 to get them to that Asian market faster, Tony Shi, the company’s vice-president, said in an interview. “It will take off from Halifax, stop in Anchorage, Alaska for fuel . . . (and land in) Zhengzhou in central China,” Shi said in an interview. There are then to be two more flights, on Jan. 14 and Jan. 21, ahead of the Chinese New Year during which the Chinese typically celebrate with elaborate feasts, and then three other flights in the month to follow. At the Halifax Stanfield International Airport, there are now only three weekly cargo flights to China. None of them are direct. Korean Air Lines’ flight from Halifax first lands in Seoul before going to Chinese cities, and Qatar Airways stops in Spain and Dohar before landing in Hong Kong. The other option for seafood companies flying in lobsters to China is to first truck them to Toronto and then fly from there to China. But every stop and detour takes time and Shi says lobsters need to be delivered quickly or many of them die en route. With a direct flight, Fishing Forever is hoping to cut the travel time to China to as little as about 18 hours. It would then take another couple of hours to clear customs in Zhengzhou and six hours to get the lobsters to Beijing or 10 hours to Shanghai, said Shi. That would mean lobsters in Beijing or Shanghai in 26-30 hours, faster than the usual time to get lobsters to those markets from Halifax now. “Our transit time is usually 36 hours to Shanghai . . . and up to 50 hours,” Michael Wolthers, the regional manager for Atlantic Canada and Quebec for logistics giant Kintetsu World Express (Canada), said in an interview. In Shelburne, First Catch Fisheries Company bought 4.5 acres of land for about $200,000 to build a seafood processing plant earlier this year. It is expected to initially employ about 30 people and then ramp up to about 100 workers. But that plant is not yet ready. First Catch has only had site preparation work done so far. Construction is slated to start in the spring and take at least a year. The company is currently buying from local lobster suppliers and shipping to markets in China. “Every week, we buy around 20,000 to 30,000 lbs. (of lobster),” said Shi. Since early December, lobster prices have hovered in the range of $8-$10 per pound, which means First Catch has been buying $160,000-$300,000 of lobster every week. That’s a lot of seafood but it’s still a lot less than the 105-tonne capacity of the Boeing 747 that Fishing Forever is hoping to fill. The China-based seafood company, a joint venture between Dalian Fishing Forever and Shenzhen Fishing Forever, is hoping to meet that excess capacity by working with other Nova Scotia seafood companies eager to ship lobster to China. Fishing Forever is currently in talks with logistics companies, including Kintetsu World Express (Canada), to set the prices to ship lobster on this charter plane but no deal has yet been inked. The KWE regional manager agrees Fishing Forever’s strategy seems like a boon for lobster markets. But until the details are finalized, he’s taking a wait-and-see approach. At the Halifax International Airport Authority there’s that same cautious optimism. Peter Spurway, the airport authority’s vice-president of corporate communications and airport experience, would only say Friday there might be an announcement in the middle of this week about a new cargo service to China. 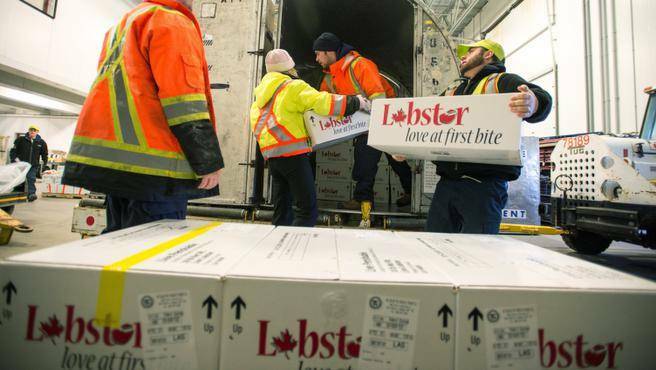 In the past month, the Halifax Stanfield International Airport has seen a boom in lobster shipments, in part because of its $5-million investment to add a roughly 182,000-square-foot pad for aircraft near the Gateway Facility. Fishing Forever has an office there. With demand growing from an increasingly-affluent Chinese middle class and the low Canadian dollar fueling exports, the airport authority’s latest investment has seen cargo flights more than triple in December, up to 15 flights from the usual five. That improved area for aircraft will also make it easier for Fishing Forever’s chartered 747 to load its cargo in Halifax. “It sure doesn’t hurt,” said Spurway.